We have all been caught in poor weather on the golf course. Sometimes it creeps up on us and others times we gamble that things will just blow over. Regardless, playing in less than perfect conditions is part of golf. We talked about being chased from the course in previous articles and this article dovetails perfectly into that article. Recently, I was playing a course that is just starting to develop. The course is putting their money where it is needed most and sometimes certain parts of the course will just have to do. I really appreciate the efforts of the maintenance staff, I believe they are critical to the success of every course, and they should be thanked often; however, I think I have to question the logic of this decision. This is a steel trailer beside the 7th tee box. 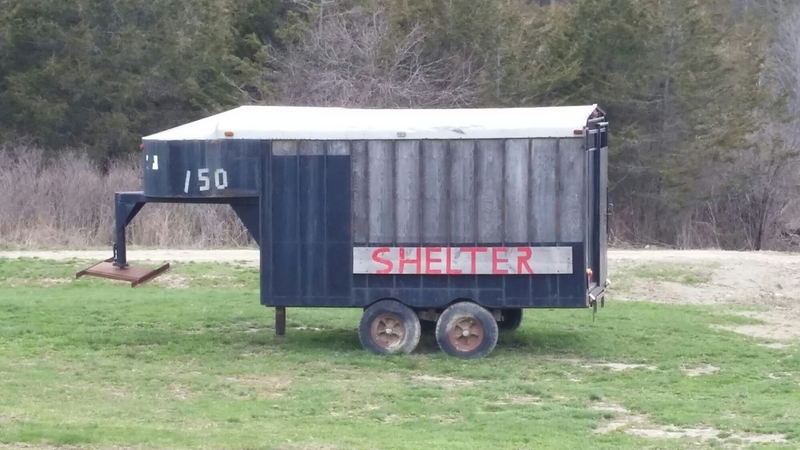 The walls look wooden, the roof is metal, and there are rubber tires, but I am not sure I would want to run into a metal shelter during the middle of a storm. What do you think? Would you go running into this shelter during a storm? ← Fixing your Golf Game – If You Can! This is one reason you will not find me on the course with rain/lightning etc in the area. You are right about lightning. I am not that adventurous. Thanks for the reblog.